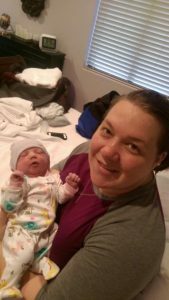 So, a little back story, my first pregnancy and birth were incredibly challenging. PUPPPs, polyhydramnios, huge leg swelling, and lower back pain were the highlights of pregnancy with my son. He finally arrived after 48 hours of natural birthing time, and after transferring to the hospital for Pitocin. Immediately after he was born I told my husband we could adopt the rest of our kids… I was 100% serious. Fast forward almost a year later and we found out we were pregnant again and I was committed to having a better birth experience. Hypnobabies was exactly the preparation I wished I’d had the first time around. Aside from almost no medical complications this time around, this pregnancy was also so calm and exciting. My pelvis hurt like the dickens to get out of bed in the morning but I was still in the best mood about all of it! Friday February 16, at 39.3 weeks I had a night of Braxton Hicks waves 5 minutes apart all night long. I was so excited, I was so ready to use my hypno tools and rock this birth! I started a playlist of birthing tracks (Birthing Day Affirmations and Easy First Stage) and laid down to sleep. The next morning the waves fell off and I was a little disappointed. My midwife suggested the Miles Circuit to help get baby into a better position and restart waves. Saturday and Sunday I did the Miles circuit 3 times and did a lot of birth ball sitting. I settled in a prepared for baby to possibly not come for another week. (It was a blessing that baby held off as my husband was waaaaaaywyyy behind on his hypno-reading and used the days to catch up and learn his Birth Partner tools. Sunday night, Monday morning? At 1:40 I woke up to waves. As everyone assured me they would, these felt… different. More intense, and more productive. They were about 7 minutes apart so I turned on my birthing time playlist and tried to get some rest. About 30 minutes later I got up and walked around the house. The movement felt good and eased some of the intensity. Before I realized it they were 5 minutes apart and I figured I should wake up my husband. As I stayed in center and focused my husband got together the last of the birth bag and got our son ready to be dropped off with family. By the time we got in the car to leave an hour later the waves were every 3 minutes and I was going more internal with each one. The hour ride to the birth center went by so fast. I focused on keeping my arms and face relaxed and using my hypnosis tools, but between waves I was shocked to see how quickly the trip was going. It didn’t feel like an hour at all. We got to the birth center at 5:30. I had used fear clearing to deal with lingering uncertainties from my first birth but was still apprehensive that the midwife would tell me I was at a 5 or 6 when she checked me. A stalled birthing was the ghost or birth past for me. Color me shocked when she said I was at 10!! A few more waves later and I was ready for the birth pool. Once I got in my water broke, and then birth got real. I did my part and kept my face and arms relaxed, and imagined my hypno-anesthesia coming right before baby’s head, my body did all the rest on its own. (OK, I’m sure all the red raspberry leaf tea and dates did their thing too. 😉) But seriously, I don’t really remember pushing. With each wave my uterus did the pushing and my cervix did the opening and I did the trusting my body to handle it. In 2 waves my body pushed our little girl out and into our arms. Amy Daire arrived at 5:59 weighing 7 pounds 11 ounces, less than 30 minutes after we arrived. It is amazing how powerfully influential the hypnosis is! In Visualize Your Birth, I imagined a 4-5 hour birthing time, a little gun shy of a prolonged birth time. I wanted to birth at home for a bit, get to the birth center and birth there for an hour or less. I wanted to feel in control the whole time and proactively cooperating with my body. Thanks to Hypnobabies that is exactly the birth I got! Immediately after Amy was born I smiled at my husband and said, “Let’s do that again.” With Hypnobabies as my preggy buddy, doing pregnancy and birth again sounds great!